Unfortunately tickets for Cliff Richard are not currently available. Cliff Richard tickets can be purchased online through our secure booking system. Sir Cliff Richard has been performing for more than four decades and is, indisputably, Britain's all-time greatest hit maker. With over 120 hit singles to his name, Cliff's hits have collectively occupied the UK charts for the equivalent of over 20 years. 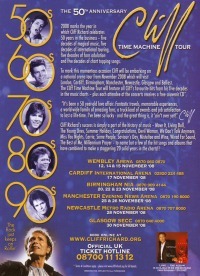 In 2008, Cliff celebrates his 50th anniversary in the music business, and to mark this momentous occasion he has announced that he will be performing 12 dates across the UK in November and December as part of his Time Machine Tour 2008. The tour will feature all of Cliff’s favourite hits from his five decades in the music charts.